Junior was born with a variety of medical issues and has grown up on an Indian reservation, getting picked on because of his glasses and speech impediments. Comforted only by his best friend Rowdy and his talent for drawing cartoons, eventually Junior is convinced that he needs to leave the reservation and go to a high school twenty-two miles away. Though Junior makes this decision to improve his life, it comes with a host of new problems. His unreliable parents usually aren't available to drive him to and from school, so he makes the trip with a combination of bus, hitchhiking and walking. 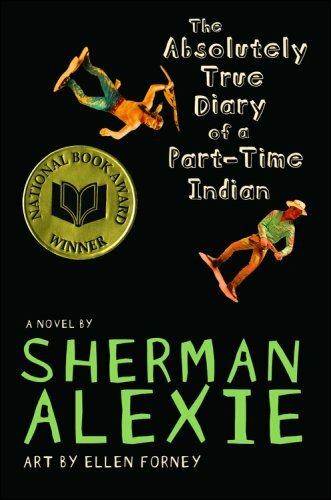 Everyone on the reservation turns against him because they feel like he's betrayed them by attending a white school, including his best friend Rowdy who will no longer speak to him. Plus now he has to try and fit in at a new school where everything is different. But Junior sees his sister leave the reservation and pursue a happier life and it only makes him more determined to do the same. Peppered throughout the book are Junior's cartoons and drawings, breaking up the text while adding color to his narration. This is a quick, quick read. I zipped through in one sitting in an evening, extremely unusual for me. I first read this book back in 2008, and I'm glad my Not-So-Young Adult book group at the library picked it to read and discuss because it's definitely worth a second reading. The most striking thing about this novel is that Junior is probably the most genuine teenage narrative voice I've read. 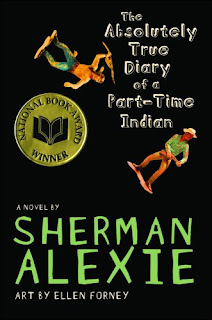 It's so hard to strike a balance in young adult fiction, making the voices self-aware and appealing enough to make a good book but still genuinely young, but Alexie has done it. Part of what makes it so realistic is Junior's colorful language, full of exaggeration and the occasional use of ALL CAPS and, of course, the fantastic illustrations. Pictures are a great way to communicate what you are unable to articulate in words and they work wonderfully here. Junior's life on the reservation is filled with tragedy and despair, yet there is a strong sense of community that is not present in his other community in Reardan. On the reservation everybody knows everybody else and they share in each other's tragedies and joys. At school in Reardan, people may be better off, but they are also more isolated. Trying to bridge the gap, Junior sees exactly what he is losing and what he stands to gain. Last night at book group, we talked a bit about how much we want to know what happened later. Some very tragic events happened during the course of the book and I don't know how Junior recovered and moved past them, but I believe he could. I wish there was a follow-up so we could revisit this funny, compelling character. In the meantime, if you haven't read this novel yet, what are you waiting for? This is supposed to be an excellent audiobook. I've been planning to listen to it for a long time now!